High heels may be the most inconvenient item that’s in style, especially in NYC where you can hit a pothole, sink into a subway grate, or even trip in embarrassing fashion. With high heel related accidents on the rise, there needs to be something to protect yourself while still maintaining your style. Introducing Solemates, the shoe care/accessory company, known for its patented product High Heeler that makes walking in heels great again. With a recent Shark Tank appearance and Oprah’s approval, Solemates is showing that mean business. AlleyWatch spoke with cofounder Monica Ferguson to learn more about the inspiration for the company and where it’s going. Solemates is a brand of women’s shoe care & accessories. Our flagship product is the patented, Solemates High Heeler which prevents stilettos from sinking into the grass. We are the first and best and only the patented heel protector in the world. Our unique hour glass shape is what allows for the product to grip the shoe without damaging it, and our proprietary water clear material has some flexibility in it which allows for flexibility between heel sizes. The Total Addressable Market (TAM) sits at the cross section of a 3 primary sectors; wedding, footwear & shoes care/accessories. The wedding industry is $500B globally with $100B domestically; 22% of weddings take place outside. The Footwear industry is $200B globally with $50B domestic. Shoe care is $50B with $20B in the US. We manufacture at a low cost, sell at a higher one. We have build great brand awareness through influencers and celebrities wearing our products (unpaid) and through partnerships with key retailers and high profile events. The recognition of our patented product has built brand equity in our name, Solemates. This brand equity has allowed us to sell other products under the brand umbrella with built-in trust from our customers. It’s so cool to see. Personal necessity. We were tired of ruining our shoes when we went to weddings, outdoor parties or walking down the treacherous streets of New York. 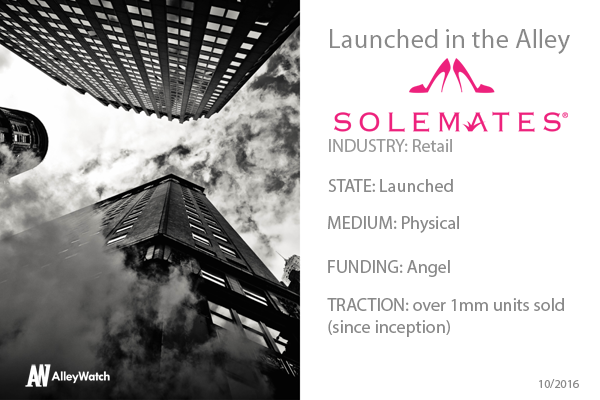 Cobblestones, subways grates & cracked sidewalks were the nemesis of the stiletto until we invented Solemates. Can you please tell us about which retail stores carry your product and how you fostered those distribution relationships? We have been really fortunate on the retail front to work with Nordstrom, David’s Bridal & DSW among many others. Garnering each retail relationship involved a long road of cold calls & networking. We once sent flowers to the receptionist at the David’s Bridal Headquarter (she was lovely, told her church group about us, and greets us with a big smile every time we are in town for a meeting).. We were tested in each store over a period of months to ensure viability and sell through. In each case we exceeded projections and expectations, which was great. Over the next 6 months, we are going to ramp up on website merchandising and refine our relationship with current customers. We don’t do enough with the customers we have; and it’s a missed opportunity. Being an entrepreneur is an endless Epistemological challenge; you don’t know what you don’t know. Growing a business is a moving target and in order to constantly be growing, you have to constantly be learning. In a large company, tools for advancement are at your disposal (at least, they were for me at Goldman Sachs). Out in the ‘wild’, tools have to be self-taught and resources creatively leveraged. You’re always seeking out the next new tools and skill sets to increase efficiency and growth. Sarah Jessica Parker. She’s a serial entrepreneur who has built a smart brand with authenticity. I’ve also heard she’s an incredibly nice person. NYC is the center of the world, where else is there to launch? I love the view of midtown from the Dream Hotel, the view of Manhattan from the Wythe and I’ve been dying to get to the William Vale.